Start by understanding that every part of your natural coloring is in harmony with every other part. Your eyes, skin and true hair color all complement each other perfectly, exactly as they are. To look your most beautiful, you don’t need to color your hair. You don’t need to wear expensive makeup or expensive clothes. You only need to identify the palette of colors that harmonizes perfectly with the colors that are already in you. The natural palette of your body harmonizes with one of 12 palettes that differ in warmth, chroma (brightness), and value (lightness). We call these different palettes seasons. Rachel’s blog is great resource in English on Color Analysis, but my favorite place to learn is Giusy’s Rossetto e Merletto blog and group. For those of you who can read Italian, I recommend heading over to her page and blog and fall in love with what is called Armocromia in our lovely language: harmony of colors. Francesca and I have both been analyzed by Giusy in Spring and for me that meant a time of experimentation with makeup, clothes and colors to fit in my Season. You might have seen an increasing number of warm smokey eyes on my Instagram feed. I am a Deep Autumn (DA) with a lot of warmth, whereas Francesca is a very neutral (not too cool, not too warm) Deep Winter (DW). These two seasons are sisters, both characterized by high contrast and depth of color and saturation. Deep Winter women are at their best in saturated, deep neutral-cool tones and have a vey high chroma, which allows them to wear primary colors very well. On the other hand Deep Autumn women have yes high contrast but a medium to high chroma and neutral-warm undertones. As you can imagine these sister seasons can borrow from each other but also have distinctive colors that will only suit them specifically. You can find examples of typical DA and DW palettes in the face charts at the beginning of the post that were made by Giusy. We will explore this in more depth looking at how some lipsticks look on a Deep Winter and a Deep Autumn next to each other. For this first episode we are looking at three lipsticks that lie on that blurred line between DA and DW. The first one we tried is Wet n Wild Cinnamon Spice. This has been categorized as a perfect Deep Autumn shade thanks to the slightly warm undertone and saturated color. For me (DA) it is one of those lipsticks I take out when I don’t know what to wear and I am sure it will look great. “When in doubt, Cinnamon Spice!” is a phrase that Fran and I say often. In fact, she loves this lipstick as well! Her predominantly neutral undertone allows her to ROCK Cinnamon Spice even though it is not in her season. 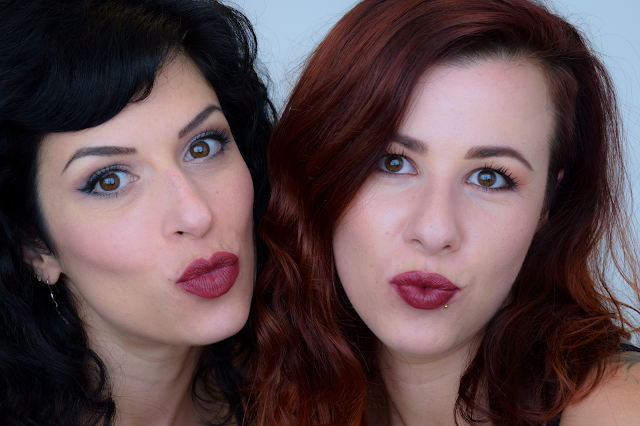 Another lipstick we both adore and looks stunning on both of us is Mac Diva, one of those lipsticks that will come across vampy on any other season than the two deepest ones. 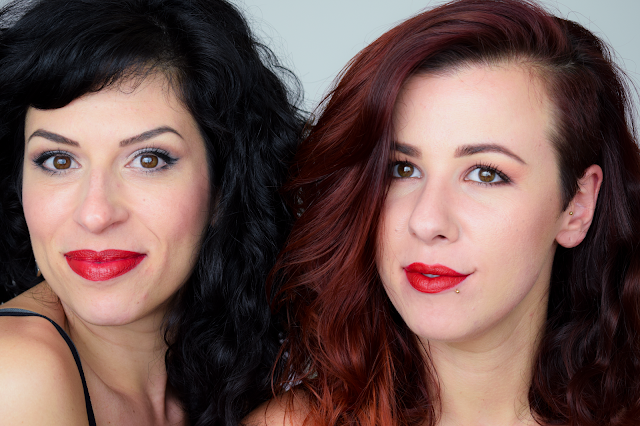 Personally Diva is a medium red for me, great statement lip, but not the darkest I would dare (remember these two here?). Temptalia (here) describes MAC Diva as “a medium-dark, warm-toned deepened red with a slightly muted quality” lipstick, but I do see a cool toned quality to it as well, which would make it a perfect ambivalent red, perfect for both Deep Autumn and Deep Winter. I have seen it on Fran (DW) and on many other Deep Autumns and it is just stunning on both seasons. The big surprise of this series is MAC Russian Red, a prototypical Winter lipstick that just stole my heart and jumped to the top of my lipstick wishlist. It is definitely a cool toned red, but when it’s on me it almost leans towards the orangey side. We were really surprised by this and couldn’t really give a rational explanation. Funny how important it is to compare lipsticks on the lips and not just swatch them on the hand. This is the end of the first appointment of the Seasonal Color Analysis Wars. We showed you three reds that against the expectations look great on bot a warm Deep Autumn and a neutral Deep Winter. I hope you enjoyed this chat, and don’t forget to go read Fran’s post on Being Cute is not a Crime and show her some love. Had you heard about colour analysis before? And what do you think of the lipsticks? Do you agree with me or do you think the lipsticks look better on one than the other?